Magento itself provides a lot of successful tips that may put your business on the map. One of them is offering coupons to your consumers. It's a fast tool to appeal to customers to visit your store more often. Magento 2 provides ability to create coupons with discounts and apply it to multiple products or per product, if conditions are met. You can create a coupon within Cart Price Rules. What are Cart Price Rules? Cart Price Rules help to apply discounts to products in shopping cart. The discount can be applied if all conditions are met, or customers enter the coupon code in the particular field. To apply a coupon with discount you need to complete 5 main steps. 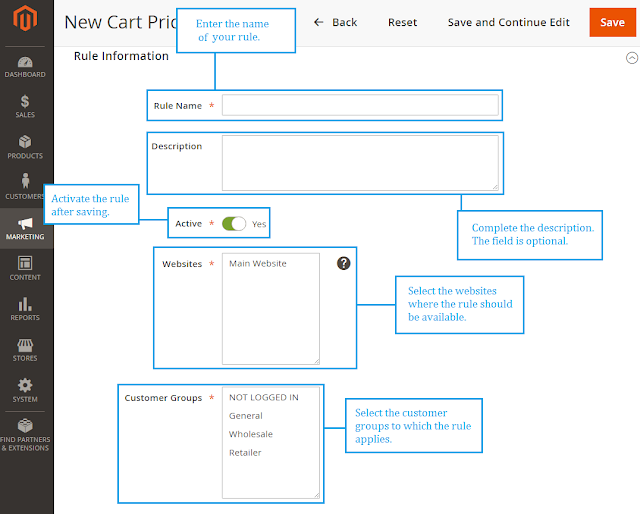 You can find Cart Price Rules following Marketing -> Promotions -> Cart Price Rules. You may see the grid with already existed rules and created coupons. To create a new rule click "Add New Rule". Rule Information – contains general information about a rule and ability to associate a coupon to this rule. Conditions – allows to set conditions that are necessary for applying discounts. The rule is enabled even if no conditions are met. Actions – allows to choose a price calculation method. Labels – helps to identify the discount and can be specified for certain store views.